East Tropical Africa: Kenya; Tanzania; India - Tamil Nadu; Australia; New Zealand; Southwestern U.S.A.: United States - California, Hawaii; Southern South America: Chile (ARS GRIN). Widely naturalised in southern Australia. (i.e. in south-eastern Queensland, New South Wales, ACT, Victoria, Tasmania, south-eastern South Australia, and south-western and western Western Australia). Also sparingly naturalised on Norfolk Island. Widely naturalised overseas, including in New Zealand (Weeds of Australia). East Tropical Africa: Kenya; Tanzania; India - Tamil Nadu; Australia; New Zealand; Southwestern U.S.A.: United States - California, Hawaii; Southern South America: Chile (ARS GRIN). Widely naturalised in southern Australia. (i.e. in south-eastern Queensland, New South Wales, ACT, Victoria, Tasmania, south-eastern South Australia, and south-western and western Western Australia). Also sparingly naturalised on Norfolk Island. Widely naturalised overseas, including in New Zealand (Weeds of Australia). Substantial climate overlap with California, and is already present in California (Cal-IPC). The use of tagasaste as a fodder crop was identified as early as 1897 in the Taranaki Region of New Zealand. As of 2011 it is still recommended as a fodder crop in some parts of the country but it also is becoming an invasive species. The Department of Conservation, a government agency responsible for protecting public conservation land, consider tagasaste to be an "environmental weed" (EOL). A serious invader of disturbed bushland on lateritic soils in higher rainfall areas (Florabase). Tree lucerne (Chamaecytisus palmensis) is regarded as an environmental weed in New South Wales (particularly in central and southern regions), Victoria, South Australia, Western Australia and Tasmania. It is particularly invasive in the non-arid inland areas of south-eastern Australia and has become naturalised in almost all areas where it has been planted as a fodder plant. This species is actively managed by community groups in South Australia and Western Australia and is currently listed as a priority environmental weed in at least one Natural Resource Management region. Tree lucerne (Chamaecytisus palmensis) also appears on numerous local environmental weed lists in the Sydney and Blue Mountains region, throughout Victoria, in south-eastern South Australia and in Tasmania. In south-western Western Australia it grows in disturbed natural vegetation on lateritic soils in higher rainfall areas it is a serious invader of disturbed bushland. In all regions where it is found, it readily invades roadsides, creek banks and other disturbed sites and spreads from these areas into native bushland and grasslands (Weeds of Australia). Temperate. Mediterranean; It is more invasive in the high rainfall areas with more than 500 mm rainfall. Grows on a wide range of soils. Appears to be more invasive on gravel soils (Herbiguide). As of 2011 it is still recommended as a fodder crop in some parts of the country but it also is becoming an invasive species. The Department of Conservation, a government agency responsible for protecting public conservation land, consider tagasaste to be an "environmental weed" (EOL). A serious invader of disturbed bushland on lateritic soils in higher rainfall areas (Florabase). Tree lucerne (Chamaecytisus palmensis) is regarded as an environmental weed in New South Wales (particularly in central and southern regions), Victoria, South Australia, Western Australia and Tasmania. It is particularly invasive in the non-arid inland areas of south-eastern Australia and has become naturalised in almost all areas where it has been planted as a fodder plant. This species is actively managed by community groups in South Australia and Western Australia and is currently listed as a priority environmental weed in at least one Natural Resource Management region. Tree lucerne (Chamaecytisus palmensis) also appears on numerous local environmental weed lists in the Sydney and Blue Mountains region, throughout Victoria, in south-eastern South Australia and in Tasmania. In south-western Western Australia it grows in disturbed natural vegetation on lateritic soils in higher rainfall areas it is a serious invader of disturbed bushland. In all regions where it is found, it readily invades roadsides, creek banks and other disturbed sites and spreads from these areas into native bushland and grasslands (Weeds of Australia). Substantial climate overlap with California, and is already present in California (Cal-IPC). Cytisus multiflorus is on the national Alert List for Environmental Weeds and is regarded as a serious environmental weed in Victoria (Weeds of Australia). C. scoparius has been introduced into several other continents outside its native range and is classified as a noxious invasive species in California, Oregon, Washington, British Columbia and parts of the east coast of North America, as well as Australia, New Zealand and India. These shrubs commonly grow in disturbed areas and along utility and transportation rights-of-way. The prolific growth of this species after timber harvest inhibits reforestation by competing with seedling trees. It is estimated that it is responsible for US$47 million in lost timber production each year in Oregon. In New Zealand, broom is estimated to cost the forestry industry NZ$90 million, and to cost farmers NZ$10 million (Wikipedia). Cytisus striatus (Portuguese broom) is a perennial shrub (family Fabaceae) found in the San Francisco Bay region, Peninsular Ranges and south coast of California. It is commonly found in coastal scrub and grasslands, where it is expected to continue to expand its range. Portuguese broom was introduced as a landscape ornamental, and is often confused with Scotch broom (Cytisus scoparius). Broom is unpalatable to most livestock except goats, so it decreases rangeland value while increasing fire hazards. These leguminous plants produce copious amounts of seed, and may resprout from the root crown if cut or grazed (Cal-IPC). Brooms are a group of shrubs introduced into North America from Europe in the mid-1800s. The four most common species are Scotch broom (Cytisus scoparius), French broom (Genista monspessulana), Spanish broom (Spartium junceum), and Portuguese broom (Cytisus striatus). Brooms initially were introduced as ornamentals, but the United States Department of Agriculture’s Natural Resources Conservation Service used them extensively for erosion control along roadsides and in mined areas. These highly competitive shrubs grow rapidly and form dense stands that most wildlife find impenetrable and unpalatable (UC IPM). Found primarily in southern Australia, New Zealand, and Europe (GBIF). This species grows along roadsides, in pastures, grasslands, heathlands, open woodlands, disturbed sites and waste areas, along waterways and drainage lines, and around old habitations in temperate, semi-arid and occasionally also sub-tropical regions. Native to the Canary Islands in the Mediterranean region (Weeds of Australia). Temperate. Mediterranean; It is more invasive in the high rainfall areas with more than 500 mm rainfall. Grows on a wide range of soils. Appears to be more invasive on gravel soils (Herbiguide). Being cultivated in Mendocino Co and sold as a fodder plant. Rare escape in California, called C. proliferus in the Weeds of California and Jepson Manual (Cal-IPC). Substantial climatic overlap with California (Cal-IPC). Germinates readily after soil disturbance, forming dense infestations that can smother native vegetation and prevent regeneration. Increases soil nitrogen, encouraging other weeds to colonise sites (Florabase). Can form dense infestations that can smother native vegetation and prevent regeneration. Its nitrogen-fixing ability also increases soil fertility, helping other weeds to colonise invaded sites and out-compete the native species (Weeds of Australia). Increases soil nitrogen levels which may affect the persistence of some native species or encourage invasion by grasses. It can form fairly dense stands exuding most other species and reducing regeneration of overstorey species especially on gravel soils in the high rainfall areas (Herbiguide). Tagasaste or Tree Lucerne is used extensively by small scale Dairy farmers in East Africa, for its ability to enable commercial milk production levels on a small plot of land planted with a living fence of self replacing Tree Lucerne. It is seen as a low cost self grown alternative to Diary meal and Alfalfa pellets. Treelucerne is used as a boundary fence and hedgerow, acting as a windbreak aimed at stopping fire, wind and yielding privacy, fodder as well as firewood (EOL). An exhaustive Google/Google Scholar search did not reveal any additional evidence of this and it defaults to a “no” answer at this time. As a fodder crop Tagasaste delivers between 23 and 27% crude protein (14–30% in Western Australia) and 18–24% crude indigestible fibre. With proper application of fertiliser it can maintain these levels even when grown on poor soils. nitially tagasaste was developed so that it was used to replace hand feeding sheep during autumn in Western Australia, when feed supplies were normally very low. This involved locking the tagasaste up for 11 months and then grazing it with 100 sheep per hectare for 1 month. As the tagasaste grows to about 3 metres height in 11 months, it must be mechanically cut while the sheep are in the paddock. 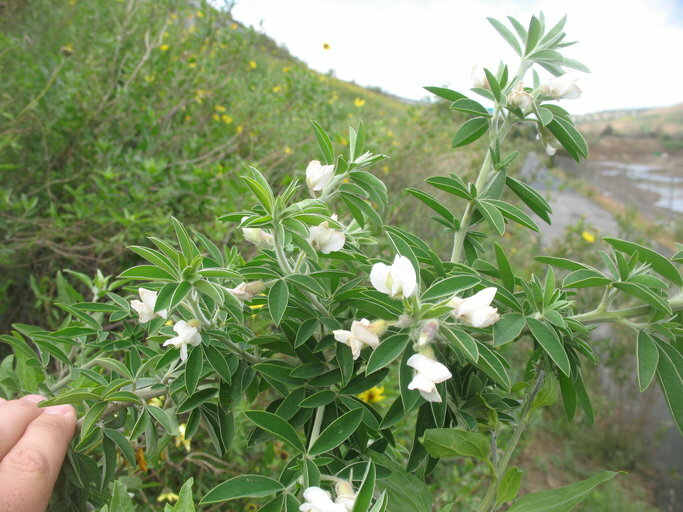 Sheep can not be set stocked on tagasaste as this can lead to plant deaths. A breakthrough came with the discovery that cattle can be set stocked on tagasaste. Cattle tongues are too large to pick off the new shoot buds, and some leaves always remain on the plant. Sheep can remove every leaf from tagasaste but this does not cause plant deaths. The removal of new buds by sheep, that appear about 6 weeks after grazing, can lead to plant deaths. Today the majority of tagasaste is used for cattle grazing with plantations able to be grazed at any time of year. Though it can grow up to 5 metres in height, when managed for grazing it is kept to less than 2 metres in height. On the poor white sands in Western Australia tagasaste has increased the animal carrying capacity from 1 to 2 Dry Sheep Equivalents with annual pastures to 8 - 10 Dry Sheep Equivalents (~ 1 cow) per hectare with mature tagasaste. In Africa, primarily used for dietary support to feed chickens, milk goats and the like, which then benefit from increased egg production and enhanced milk production due to the Alfalfa quality fodder harvested from a "living" haystack. Tree Lucerne has also been found to make excellent fish food for Koi and Carp species. Tree Lucerne is very valuable as high value nectar and pollen bee forage and used by small and large scale bee farmers. Tagasaste or Tree Lucerne is used extensively by small scale Dairy farmers in East Africa, for its ability to enable commercial milk production levels on a small plot of land planted with a living fence of self replacing Tree Lucerne (EOL). Seeds are poisonous to humans (Florabase; Weeds of Australia). Contains alkaloids. No cases have been recorded in Australia. Toxicity would only be suspected where large quantities were eaten (Herbiguide). Unlikely poison for humans, and eaten by livestock and birds with no issues, and this is a "no". Tree grows 3-4 m high. Tagasaste or Tree Lucerne is used extensively by small scale Dairy farmers in East Africa, for its ability to enable commercial milk production levels on a small plot of land planted with a living fence of self replacing Tree Lucerne. It is seen as a low cost self grown alternative to Diary meal and Alfalfa pellets. Treelucerne is used as a boundary fence and hedgerow, acting as a windbreak aimed at stopping fire, wind and yielding privacy, fodder as well as firewood (EOL). Germinates readily after soil disturbance, forming dense infestations that can smother native vegetation and prevent regeneration. Increases soil nitrogen, encouraging other weeds to colonise sites (Florabase). Can form dense infestations that can smother native vegetation and prevent regeneration. Its nitrogen-fixing ability also increases soil fertility, helping other weeds to colonise invaded sites and out-compete the native species (Weeds of Australia). Increases soil nitrogen levels which may affect the persistence of some native species or encourage invasion by grasses. It can form fairly dense stands excluding most other species and reducing regeneration of overstorey species especially on gravel soils in the high rainfall areas (Herbiguide). Seedbank persistence. Long, 10+ years. Fire response. Soil stored seed germinates prolifically following fire and mature plants occasionally resprout (Florabase). However, reproduces mainly by seed (Herbiguide). Reproduces mainly by seed and can resprout after damage (Florabase; Herbiguide). This species reproduces mainly by seed (Weeds of Australia). Each fruit contains 11+ seeds; the seeds are tiny (45,000/kg) (EOL). Tree lucerne (Chamaecytisus palmensis) accumulates large quantities of long-lived seeds in the soil seed bank and readily germinates after fire or other disturbance (Weeds of Australia). 10 seeds per fruit, and pictures of the tree show hundreds if not thousands of pods, so this would likely count as copious seed production, although germination levels are low due to high dormancy (NSW Agriculture). Seedbank persistence. Long, 10+ years. Fire response. Soil stored seed germinates prolifically following fire and mature plants occasionally resprout. Germinates readily after soil disturbance, forming dense infestations that can smother native vegetation and prevent regeneration. Increases soil nitrogen, encouraging other weeds to colonise sites (Florabase). Tree lucerne (Chamaecytisus palmensis) accumulates large quantities of long-lived seeds in the soil seed bank and readily germinates after fire or other disturbance (Weeds of Australia). Has high levels of hard seed that may remain dormant for more than 10 years; Produces large quantities of seed but the germinability is often less than 50%; Seed requires scarification or hot water treatment to achieve reasonable levels of germination (Herbiguide). The hard coat of tagasaste seed results in a very low germination of untreated seed (NSW Agriculture). Time to first flowering: 3 years (Florabase; Herbiguide). Tagasaste flowers during the early rainy season, typically June to October in Australia, New Zealand and East Africa. In Western Australia tagasaste will commence flowering in winter (~ June). The seeds are mature and shed in early summer (first warm day in December) (EOL). Flowering occurs mainly during late autumn, winter and spring (i.e. from April to October) (Weeds of Australia). July to October in SA; June to September in Perth; Winter and early spring in Western Australia; June to October in SE Australia (Herbiguide). Flowers March - May in California (Calflora; Jepson). In California, seed production is not > 3 months. Tree Lucerne can be used as a fodder crop and it is a favourite food of the New Zealand native Wood Pigeons (TERRAIN). Seed Dispersal: Seeds are dehiscent, and dispersed by ants, birds, slashing, garden refuse, plantings, machinery, soil movement (Florabase). This species reproduces mainly by seed, which are thought to be spread by ants, birds and slashing. They can also be dispersed short distances when they are explosively released from the mature fruit. Ripe seed can be dispersed several meters by the explosive opening of pods (Herbiguide). Birds likely disperse seeds long-distance regularly. Taranaki Educational Resource Research Analysis and Information Network (2016). (TERRAIN) Taranaki Educational Resource Research Analysis and Information Network. Seed Dispersal: Seeds are dehiscent, and dispersed by ants, birds, slashing, garden refuse, plantings, machinery, soil movement (Florabase). This species reproduces mainly by seed, which are thought to be spread by ants, birds and slashing. There is no information on dispersal by wind or water. Seeds are dehiscent, and dispersed by ants, birds, slashing, garden refuse, plantings, machinery, soil movement (Florabase). They are dispersed longer distances by deliberate plantings, in dumped garden waste, by machinery, and in contaminated soil (Weeds of Australia). Dumping of garden refuse is a common source of infestation. While there are no morphological adaptations for this type of dispersal, extensive cultivation would facilitate long-distance anthropogenic dispersal. Reviewed by Gina Darin and Irina Irvine.